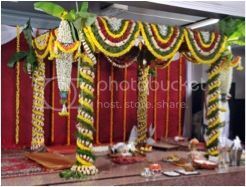 Varmala is a tradition from ancient times where a beautiful garland of flowers (jaimala) symbolizes a proposal of marriage. 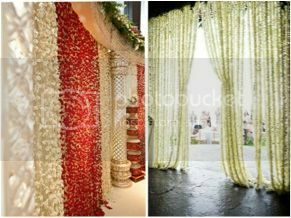 Malas or hanging garlands have been used as wedding décor in India since ancient times. They have a special meaning depending on if they are Hindu or Buddhist. In Hinduism a mala represents the 108 names that can have the god Vishnu, the creator of the universe and the god of goodness, so, that’s the reason to use them in a Hindu wedding. The tradition of jaimalas is one of the many rituals in an Indian wedding. When the groom puts jaimala to his wife, they are declared husband and wife and all best wishes are in the jaimalas for a long, happy and healthy life together. The bride also puts jaimala to the groom. This exchange represent among other things respect for each other. But garlands of flowers (malas) are not only used in the neck. Today, you can use to beautify anywhere. 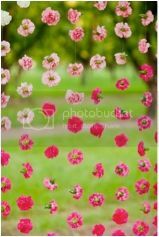 If you want to make an impact from the first moment, you can use beautiful curtain at the entrance of the hall or to decorate the walls. 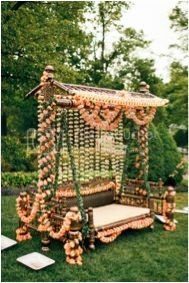 The jhula, is a very important element in the wedding and if you decorate it with malas will look awesome. Some are simpler but equally beautiful designs. Sakurako Yakushiji, COO, Master Florist & Decor Expert of LATIN ASIA, has impeccable logistics knowledge, extraordinary floral design skills with a Masters degree and international license in Japanese floral art. 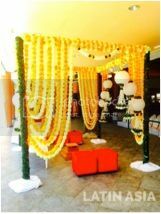 Having her own Hindu wedding ceremony at Agra India, she and her team understand the deep meaning of what it takes to create a dream Destination Indian wedding regardless being Hindu, Sikh or Ismaili Muslim. Saku has trained people from scratch not only to execute great performances, but to make every member of LATIN ASIA a better person creating new opportunities every day.